In addition, members will have access to 40 pages of high level Battalion Chief fire department promotional oral interview questions and answers (as well as 75 pages of Captain/Lieutenant questions), 4 high level complex Battalion Chief level and 5 Captain/Lieutenant fire department In-basket exercises with 10 items in each exercise (over 90 issues to manage), 8 firefighter employee counseling video scenarios, and over 30 fire department writing assignments and accompanying documents that our members will likely encounter in a fire department assessment center. 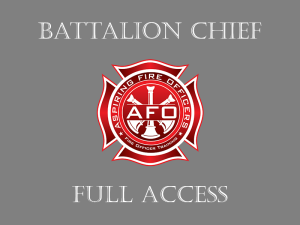 Battalion Chief membership ensures access to over 75 focused and specific videos that will help them prepare for all aspects of their fire assessment center preparation and includes dozens of additional downloads at no additional charge. This is focused training for Battalion Chief fire assessment center preparation! 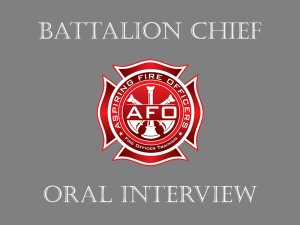 The Oral Interview section of the site includes over 40-pages of high level Battalion Chief promotional interview questions that our members will likely encounter on their fire assessment center examination and an example of a complete, high scoring answer. We also include an additional 75 pages of Captain/Lieutenant interview questions and answers that you can review to ensure that you are on the right track. The questions provide a solid foundation for the aspiring Battalion Chief and have been used in Battalion Chief assessment centers across the country. The Battalion Chief In-Basket Exercises include 4 high level BC exercises and an additional 5 Captain/Lieutenant exercises. There are two parts to each exercise, an assignment and an answer key. The assignment is presented in a format typical to assessment center exercises. It includes the basic information that sets the stage for the exercise, a time limit and the scenarios that make up each in-basket exercise. The answer key has all the information included in the assignment plus detailed responses and actions for each scenario. The Battalion Chief responses are presented in a narrative format. We recommend the narrative response format for the Battalion Chief level because the raters expect a higher-level presentation from Battalion Chief candidates. You will find that each exercise will test your agency knowledge as well as your organizational skills. You will need to be creative in your solutions to solve the 40 different items that you are presented within the scenarios. These scenarios are similar to what you will see in your Battalion Chief’s exam and after you get promoted. Our members learn our system to effectively manage a fire department In-Basket scenario and maximize their score for the exercise. The emergency scene fire simulations are first run as a dynamic fire simulation with officers communicating on the radio and providing feedback to the incident commander. The scenarios are then run as a static fire simulation where the candidate simply explains how he or she would manage the incident. The method of fire assessment center preparation ensures that whichever way our members are expected to perform in their fire assessment center they have been able to view dozens of relevant scenarios. Following each fire simulation, the raters question the candidate about their actions and rationale, or we discuss the decision-making process used during the scenario. 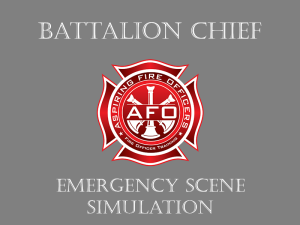 Each dynamic scenario contains a detailed explanation of the transfer of command to the arriving chief officer. *******All of the Battalion Chief significant incidents contained within this section are managed with at least 6 Engines, 3 Ladder Trucks and one EMT Ambulance. It is important to note that while these incidents are managed from the Battalion Chief’s perspective. We emphasize the principles of command, incident action plans, assignments and objectives on all of the incidents. The fire department Employee-Counseling portion begins with a video that teaches our members the 8-Step Process. Members will learn to use this system to conduct a fire department employee counseling session. It provides a method to follow to stay on track and elicit the proper information during the counseling session. Additionally, our members have unlimited access to 14 video scenarios that demonstrate the employee counseling process in action with a fire officer conducting a counseling session with a firefighter. The scenarios also build on complexity with multiple members of the crew being counseled to correct behavior or policy violations. To enhance the learning process, each step of the 8-Step Process is visible on the screen. ****It is important to note that each of these scenarios is managed by a Fire Officer or a Battalion Chief. The principles of managing a troubled employee and using the 8-step process would be the same as would be used by a Fire Officer or Battalion Chief. The Battalion Chief Writing Exercise portion provides over 30 examples of every type of fire department writing assignment a candidate could expect to encounter in a fire department assessment center. Our members are provided with a document that describes the deliverable they are expected to produce including all of the facts needed to develop the finished paper. Our members then compare their work with the document we have written on the same topic. The documents we have included in the writing section of our assessment center preparation include: Memos, Notice of Discussions, Oral Reprimands, Written Reprimands, Performance Improvement Plans, Public Response Letters, Administrative Reports and Essays.